Developed for babies and young children, the Little Aurelia from Aurelia Probiotic Skincare Sleep Time Pillow Mist blends soothing essential oils with gentle yet effective botanical ingredients. 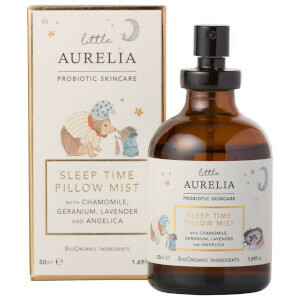 Infused with Rose Quartz Crystal and a soothing blend of Angelica, Chamomile and Lavender, the delicate, award-winning mist creates a calming and comforting atmosphere to help your little one drift off into a peaceful night's sleep. Ideal for spritzing onto cot bedding, pyjamas or sleep suits. Housed in a spray bottle decorated with the brand's signature woodland animal design. Shake well before every use and lightly spritz onto your baby’s cot bedding, sleep suit or pyjamas every night before bedtime. Aqua (Water), Citrus Aurantium Amara (Bitter Orange) Flower Water, Polyglyceryl-4 Caprate (vegetable derived), Glycerin (Vegetable), Anthemis Nobilis (Roman Chamomile) Flower Oil, Angelica Archangelica (Angelica) Root Oil, Cananga Odorata (Ylang Ylang) Flower Oil, Agonis Fragrans (Fragonia) Branch/Leaf Oil, Pelargonium Graveolens (Geranium Bourbon) Flower Oil, Lavandula Angustifolia (Lavender) Flower Oil, Quartz Powder, Xanthan Gum (naturally derived), Sodium Benzoate, Lactic Acid, Potassium Sorbate, Benzyl Alcohol, Dehydroacetic Acid (natural association approved preservative), *Limonene, *Linalool, *Geraniol, *Citral, *Benzyl Benzoate, *Benzyl Salicylate, *Farnesol, *Citronellol (*naturally occurring in essential oil).